WHEW--We breathed a huge sigh of relief this morning. In today's modern Age of Camping, you have to be ready to rock and roll months in advance of when you really want to go camping. Back in the Good Old Days of Ozzie & Harriet camping out of the back of their 1955 Chevy, why heck, you could go just about anywhere and camp. Not any more! 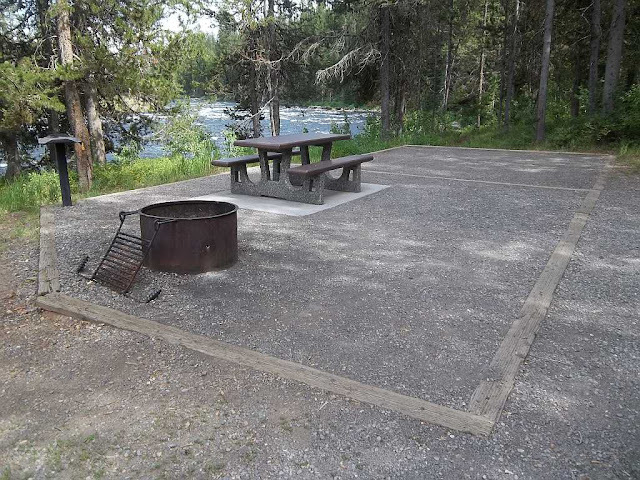 People jump their favorite campsites practically the second they become available on "Recreaton.Gov." The gubmint's reservation website had some glitches and we were unable to make reservations until today. We almost lost out as our favorite spot was essentially already booked for 100% of the available dates. You can only book out six months in advance. That means the last booking date is July 28th. We got lucky and snagged the July 28th date as the first of three nights at Site A21 at Riverside Campground in Island Park. The only other dates available were July 8th & 9th and we snagged those two nights as well. Each reservation costs $9 extra for using the online system. It's the best $9 we spend in our summer camping. It is just awesomely cool to drive up and see your name hanging from the campsite post. It's like having your own timeshare already booked. For those five nights, we own the place. So there you have it. If you don't jump super early, you can totally forget about getting your favorite campsite. Some folks we know simply won't play the online game to get a campsite. They still cling to the notion that it should be the it was in the Good Old Days. Well, it's not that way anymore. Those days are long gone and will never return. If you want the premium spots in the best campgrounds, you're going to have to play the game and hope you can beat your competitors. Having five nights at Space A21 this coming summer is WELL worth the hassle factor. We are both very jazzed. We just made reservations for a national forest campground on the Gunflint Trail out of Grand Marais, MN for Aug. 4 - 7. Had to time it perfectly to get the sites/dates we wanted, down to making the reservation at "10 AM E.S.Time." Success! We agree, these days one must plan ahead. Meant to say "Connie & Michael"